In a bid to defuse an increasingly divisive political crisis, Ukrainian President Viktor Yanukovych has agreed to hold early presidential elections and enact changes to the country’s constitution. The decision was reached after high-level talks involving opposition leaders Vitali Klitschko, Arseny Yatsenyuk and Oleg Yyagnbok, the German and Polish foreign ministers and Russia’s ombudsman Vladimir Lukin. Regardless of how the concessions are implemented or accepted by protesters, the protracted crisis has created a new reality in Ukraine, one that will present significant challenges for any political forces that come to power. Yanukovych’s latest political concession to the opposition follows over two months of unrest, which on February 18 exploded into bitter gun battles between anti-government protesters and riot police, leaving at least 80 people dead, including 16 police officers. As part of the deal, new presidential elections will be held sometime before December and the Ukrainian constitution will be reverted back to its 2004 form, which relinquishes presidential powers and favors increased parliamentary authority. The agreement to end the unrest also calls for the formation of a transitional government within 10 days. Critical will be the reaction from protesters who remain camped out on Kiev’s Independent Square (Maidan). The more radical elements, such as the Right Sector, have been left out of the negotiations. They remain skeptical of the recent compromise between Yanukovych and the moderate opposition leaders and have vowed to continue their struggle until the president resigns. Emboldened by their much fought-for victory in forcing the president to the negotiation table, the group will likely fall under increased pressure from the moderate opposition which now must uphold their part of the deal to end street protests and allow the political process to move forward. It is unclear how these concessions will be worked out, and recent rumors, such as Yanukovych fleeing the capital, indicate the process will be anything but smooth. But while a more dangerous security situation in Kiev appears to have been averted, the crisis has generated a new set of challenges whose dangerous trajectory may now be irreversible. The crisis has not only resulted in more severe financial problems for the country; it has underscored and deepened longstanding cultural, linguistic and religious divisions, mainly between the eastern and western halves of the country. 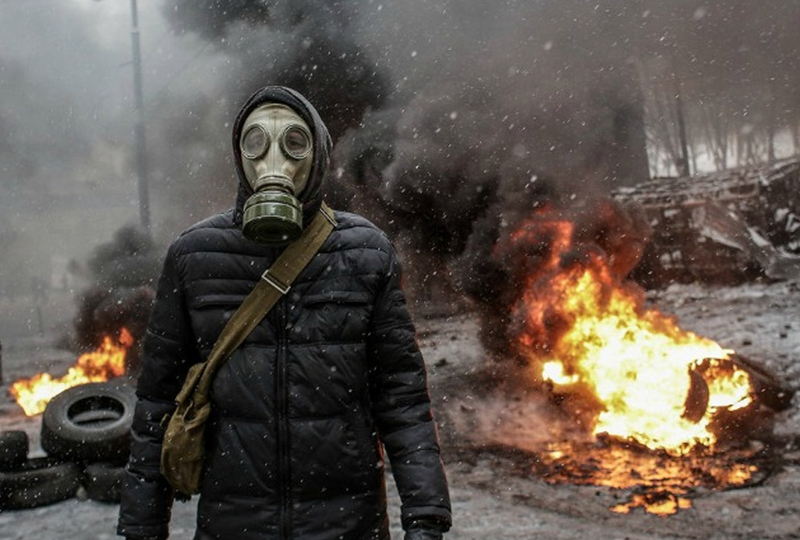 Ukraine’s mounting economic troubles have formed the backdrop of the recent crisis. With rapidly decreasing currency reserves and a $13 billion debt payment scheduled this year, Yanukovych opted in November last year for a $15 billion loan from Russia and cheaper natural gas prices after reconsidering the perceived economic benefits against immediate consequences of an EU association agreement and trade deal. The apparent U-turn in EU integration efforts sparked weeks of protests that have only aggravated the country’s existing financial difficulties. Ukraine’s currency has sharply devaluated in recent weeks and Moscow has now postponed a decision to purchase $2 billion worth Eurobonds from Ukraine until the political situation in Kiev becomes clearer. With Yanukovych and his Party of Regions now weakened, there are rising concerns over the country’s future within the more prosperous eastern and southern regions, whose heavily industrialized economies are closely integrated with Russia. In the lead-up to the peace accord, a number of officials from eastern Ukraine floated the idea of the country adopting a federalist model. Such a reformed political structure would provide greater fiscal autonomy to the regions and substantially benefit the eastern regions, where per capita GDP is already estimated at over three times of that found even in more richer areas of western Ukraine. Russia has openly supported this notion, as any added authority in these regions could provide valuable leverage over what would then likely be an economically weakened western Ukrainian. Perhaps most concerning is the coastal region of Crimea, where the idea of all out separatism is beginning to take deeper root, especially among the region’s majority ethnic Russian population. Home to a Russian naval fleet, this strategic peninsula on the Black Sea was part of Russia until it was incorporated into the Ukrainian Soviet Republic in 1954. Such sentiment goes back years in Crimea but was reignited by events in pro-European western Ukraine, where in the region of Lviv, the regional council’s executive committee, also known as the People’s Rada, declared independence from the central government during the height of the crisis. Speaking to Russian news agency Interfax, the speaker of the Crimea parliament, Volodymyr Konstantinov, suggested that his region might secede from Ukraine if the country breaks apart in the event of a civil war. Meanwhile, The Financial Times quoted an unnamed Russian official as saying that under such hypothetical circumstances, the Russian-majority Crimea would be “the first to go” and Russia would “go in to protect it, just as we did in Georgia”, referring to the 2008 war Russia fought with Georgia over its breakaway region of South Ossetia. Ukraine’s future leadership, whatever its exact political makeup, will not easily overcome these structural challenges. The intern government that is expected to soon take shape will not only have to convince hard line protestors of the need to adhere to a tentative peace plan; it will have to contend with mounting economic troubles and the possibility that much-needed economic aid, currently being provided by Russia, will no longer be readily available if an exclusively European policy course is pursued. The ability to manage such realities will be complicated by what is now more clearly a deeply divided nation, whose entrenched divisions cannot be allayed by mere cosmetic measures such as political concessions. Such a reality will likely portend further political turmoil. The worst may be yet to come. Martin Harris, a freelance journalist and analyst based in the Eurasia region, exclusively for the online magazine “New Eastern Outlook”.